Home VgamerZ OriginalZ Whatever Happened To… The Alien Hominid? Whatever Happened To… The Alien Hominid? Ah, this little dude. Many tedious school periods were spent in his company, stealthily knifing and blasting my way through an hour that would otherwise be dedicated to the foreign policy of Louis XIV or some such. In those days, finding a game site that wasn’t blocked at school made you feel like a futuristic space-prophet genius from the year 5000. 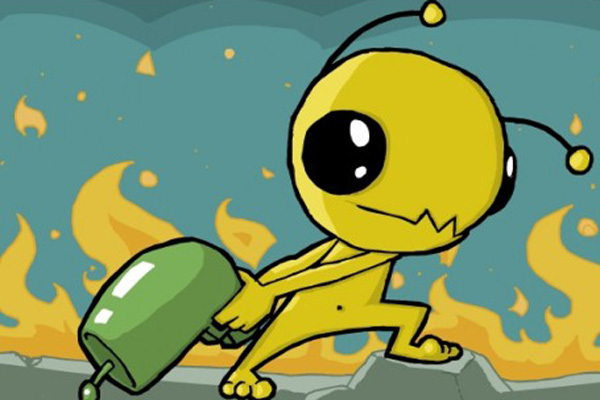 Yes indeed, Alien Hominid began life as a humble Newgrounds flash game. A deeply simplistic, utterly uncompromising arcade beat ‘em up, which cast you as the adorable extraterrestrial with an insatiable hunger for blood. The premise is essentially E.T gone horribly, horribly wrong. When this yellow fellow crash lands on Earth, he doesn’t make friends with a boy called Elliot and cruise about with him on a flying bicycle. Not even slightly. Instead, the FBI swiftly locate the wreakage, confiscate him ship and leave him for dead. Is the Alien Hominid amused by this? He is not. Your objective is to fight your way to the FBI’s base and recover your craft, which calls for a crop of side-scrolling, deeply violent levels. Think Streets of Rage with suits-and-sunglasses special agents in place of the unwashed punks, and you’re kinda sorta there. By beat ‘em up, I really meant more of a shoot-n’-slash ‘em up (because that’s a thing). Both you and your opponents –generally– are killed in a single hit, which you can administer via your ray gun or a close range knife attack. You can also, if you’re feeling theatrical, leap on opponents’ shoulders and bite their heads off. It’s all very Itchy and Scratchy. 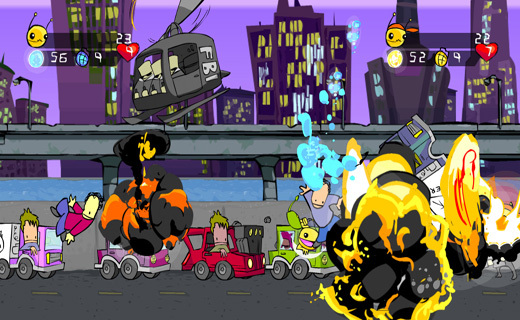 The game was a hit for its gleeful, toontastic violence, and its unconventional sense of humour. In the snowbound level, riding a vast yeti through hordes of FBI guys and watching as it barrels through and/or eats them was hilarious. There was great potential to take this concept all kinds of places, and the recent resurgence of games with magnificent 2d art would have appreciated more from the Alien Hominid. The little guy warranted a console release a few years later, and a port for the Game Boy Advance. Beyond an HD re-release of same in 2007, though, this face-biting fiend hasn’t been seen since. The world needs more hideous, yeti-based violence.